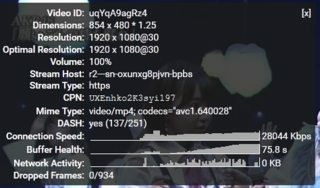 Really slow speed connection in Youtube with Opera. 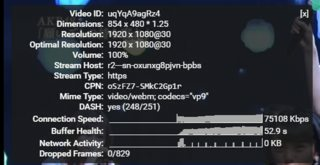 Hi, do you have any idea why with Opera I have always a really slow speed connection in Youtube? I have always to watch Yuotube videos with another browser (Firefox), with Opera most of the times is impossible. For example now with Opera I have an average speed of ~1600Kbps, but with Firefox I have a speed of ~12000Kbps. I have no problems with my internet connection, I think it's browser related, or something with Google tecnology, or compatibility, I don't know. I have not tried with Chrome. Turbo or VPN enabled by chance? They may slow down the connection. Turbo and vpn are disabled. It may have a relation to DASH if you are on an unstable network. The technology buffers only the part of the video that you are watching and a little after it. It has many advantages but may cause playback issues for some. I am eager to know if you could replicate it with Chrome or another Chromium-based web browser. Both Opera and Chromium got more than 2 times the speed that Firefox got. Maybe because of the user of webm/vp9 instead of mp4/h264? same issue here. Turbo and vpn disabled, Youtube loads videos in 144p. This only happens with Opera, any suggestions? The browser is up to date. Where are the screen shots with the speeds? 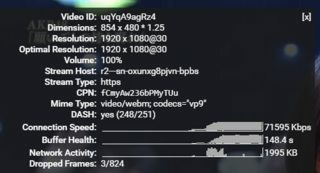 Youtube loads videos in 144p. @venima Please open another topic, this one is too old.